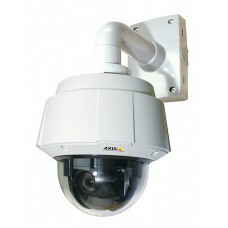 Q6032-E is an outdoor-ready PTZ dome IP camera for cost-efficient and reliable installation in demanding applications. It is ideal for use at airports, seaports, city and perimeter surveillance. The camera is powered through High Power over Ethernet. It has a fast and precise pan/tilt response. It can tilt 20° above the horizon for a total tilt range of 220°, especially over uneven terrain. It has 35x optical and 12x digital zoom. License plates can be read from a distance of 160 m (525 ft.) The camera has an autotracking functionality that can automatically detect and follow a moving object within the camera's field of view.